CAUTION: Bonds Skin Instantly: Can't Keep a Good Necron Down! Can't Keep a Good Necron Down! Boy time sure does fly! 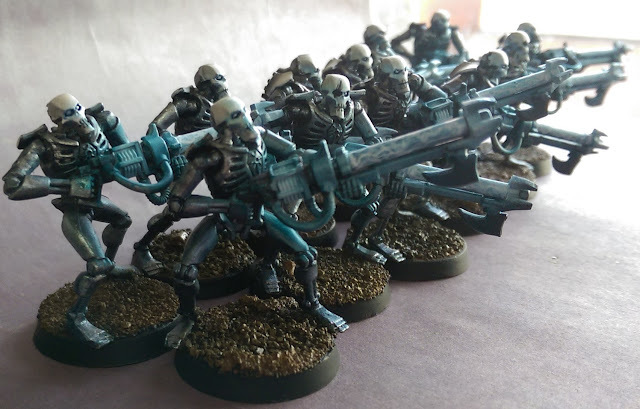 Here's a quick update showing off some Necron Warriors I painted last night. These were painted for the annual Toys for Tots Freebootaz 40K Charity Auction, where a bunch of us try to help some kids in need have a happy Christmas. If you are interested in bidding, stay tuned and I will post updates when the auctions go live, hopefully with some high resolution photos as well. Anyway, enough with the wordy words.